Follows the 2nd GAIA Newsletteer January 2019, Volume 2. 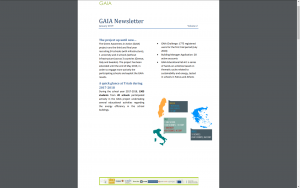 The Green Awareness in Action (GAIA) project runs the third and final year recruiting 24 schools (with infrastructure), 1 university and 2 schools (without infrastructure) across 3 countries (Greece, Italy and Sweden). For more information click through the image below.